Translations: Kai no Bouken / The Quest of Ki English Translation & Sprite Hack Released! 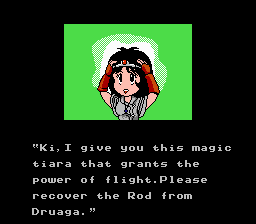 Zynk Oxhyde has completed the English translation hack of the obscure game sequel, or rather prologue, of The Tower of Druaga for the NES. Back in 2001, this hack was first conceived by an unknown romhacking group but have lost interest, leaving Tomato, a professional videogame translator, & his translated script of the game. Since then, Tomato left his script in the Abandoned projects section of RHDN. On May 2013, Zynk happened to wander into the Abandoned section in search of a project to do. The file, which contained the English script, was accompanied by garbled texts (of which might have been the Japanese text with ANSI to Unicode contradictions), in spite of that, the English texts were spared. Zynk announced this to the RHDN forum, which caught Tomato's attention & gave Zynk permission to use his script. However, not all of the script were translated which led Zynk to translate the rest of it by context. After 3 months, the translation was completed but revisions were still made in lieu with Zynk's other plans for this hack, a player sprite edit. Zynk thought that the game's graphics are a bit bland especially the player's character, Ki. Ki's sprite lacks detail in comparison with box-art & official images of her. In addition to that, Zynk also edited the treasure box items to look like those from The Tower of Druaga. Sprite editing was done after a few weeks. After all that, the patch for the translation was released with the sprite hack also released separately. However, after the hacks were approved, the files were unusable because of URL conflicts. With KingMike's aid, the direct link URLs were easily fixed! In conclusion, the hacks are now readily available for the public! Re: Translations: Kai no Bouken / The Quest of Ki English Translation & Sprite Hack Released! weird to say, but this is my favorite announcement for a translation in the way it's written. Just enough info. I love how you refer to the script as "Tomato's" script when it's his translation and the script was obviously penned by whoever was hired to write Kai no Bouken. Nothing like needing "permission" for a functional work as opposed to a creative one to further delay the work process. This post’s normal and not weird. As a side note, I wasn't a professional translator at the time, this was actually one of my early fan translations. Doe this game supposed to have this floaty jump. or did I get a bad rom dump? If you mean after , and . it's probably to spare some room for the texts. Yeah, but if it's intentional, sorry about my comment. It's great to see such a lovely news article! I wish they all had such character to them. Congrats on completing this translation. Another one bites the dust! You should probably change your project page link to 'http://www.romhacking.net/translations/2029/', you incorrectly linked to the game page. Then, if you do, add some more narrative to the news! Ha! I intentionally linked it to the game page because both translation & sprite hacks can be linked there, is that okay? Still, I could edit the news (saw a typo) if I know how; there's no modify button to click. Understood, but then the news doesn't cross link to EITHER project, which is the functional point of the field. I would say link one or the other as the primary project page and put a link in the news to the other. The way it stands now, it's broken and links to no valid items. So, it will get flagged by system maintenance as a broken news database entry and be arbitrarily addressed at that time to fix. There's a long-winded story why we don't check it for valid project link at the time of the news submission. Suffice to say things develop very slowly here and things are often in transient states for extended periods of time. You can edit your news from the news section by the way (buttons at bottom of the news articles). I tried applying this patch to the No-Intro ROM (Quest of Ki, The (Japan).nes). It wouldn't apply. Are you sure you're using the patch correctly? The patch is in .bps format, so you need two ROMs - the original & a copy. Apply the patch first on the original, then select the copy. The copy will be the hacked version. It might be the same one I had that had a bad header. Try running it in FCEUX. If the graphics in-game are glitched up, it's a bad header. Open the ROM in a hex editor and change address $00006 from 40 to 41. Version 2.0 is now up!